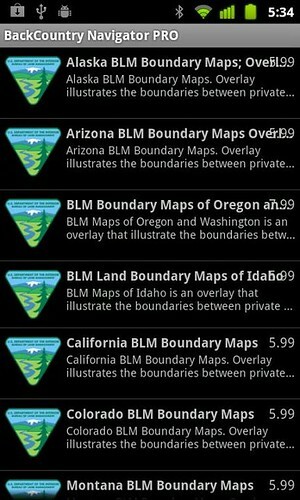 Another new add-on available for purchase from BackCountry Navigator PRO is Oregon and Washington BLM maps. These maps will show the boundaries of federal, state and public lands of these states. The BLM in Oregon and Washington administers approximately 14 million acres of rangelands. It manages rangeland environment and rangeland health assessments to evaluate the quality of watershed function, ecological processes, water and habitats of native, threatened, and endangered species. Below are just a few of the spectacular National Landscape Conservation System sites in Oregon and Washington states. Hyatt Lake Recreation Complex – 745 acre Hyatt Lake Recreation Area provides opportunities for camping, hiking, fishing, and boating. Recreational Use Permits for camping and day-use are required and available on a first-come, first-served basis from the visitor contact station at the facility entrance and at the self-service pay stations located at main campground entrance. Campgrounds open at the beginning of fishing season in late April and close October 31 of each year. A 14-day camping limit is in effect for all campgrounds. ∙ Pacific Crest National Scenic Trail or PCT is 2,650 miles of America's most precious treasure located in the Western United States. Countless hikers and horse riders prepare each year to embark in hiking and experience nature at its best at Pacific Crest Trail. Some travels a few miles only to see its beauty. ∙ Archaeological and Historical Resources – cultural resources can include a vast range in types of sites and landscapes that result from past human activities. Archaeological sites on public lands in Oregon and Washington include rock shelters, quarries, campsites, village sites, and rock art sites. Historic sites and structures on public lands include lighthouses, ranches and homesteads, railroad logging camps and many roads and trails. Some sites have traditional cultural importance to the region's American Indian tribes and other groups. These locations are often of religious significance where traditional activities were carried out. Many kinds of fossils can be found preserved in rocks of the Earth's crust on the BLM-managed public lands in Oregon and Washington. Some are excellent in scientific importance as fossil deposits in eastern Oregon, in particular, represent a time when primitive mammals began to change and adapt to new environments and show a slow transition into faunas that we recognize today. In Oregon and Washington, the BLM administers approximately 14 million acres of rangelands. Any U.S. citizen or validly licensed business can apply for a BLM grazing permit or lease. For complete information about rangelands/grazing, this will guide you. The public lands in Oregon and Washington managed by the BLM offers you unlimited recreation opportunities. Picnic with family and friends in western Oregon one weekend, then explore the remote wild lands east of the Cascade Mountains the next. Hiking, camping, hunting, fishing and boating are just some of the many activities to enjoy. Just don’t forget to go to BackCountry Navigator PRO and purchase an add-on map for Oregon and Washington through the "Purchase Add-on" menu. BackCountry Navigator will be your digital guide in your outdoor adventures there. Geographic information system dataset can be found here. Have fun and be one with nature.